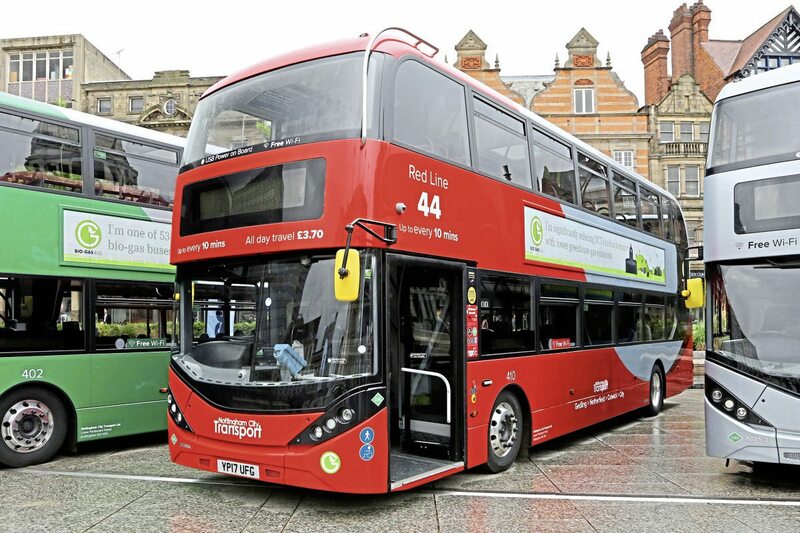 With £4.4m funding from the Government’s Office for Low Emission Vehicles (OLEV) awarded in July 2016, NCT in partnership with Nottingham City Council, initiated investments expected to total £17m that will deliver the largest fleet of gas powered double deck buses in the country so far, together with associated fueling facilities at its depot in central Nottingham. 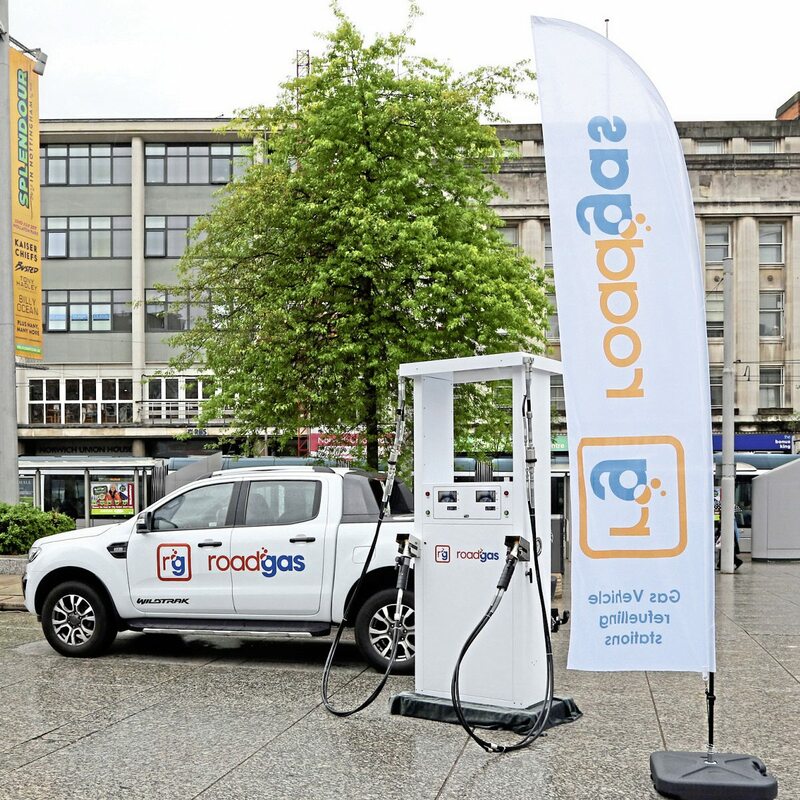 The order for the fleet of 53 vehicles was placed with Scania who are working with partners ADL and Roadgas to deliver a project that will further emphasize Nottingham’s leading role in lowering emissions from public transport. 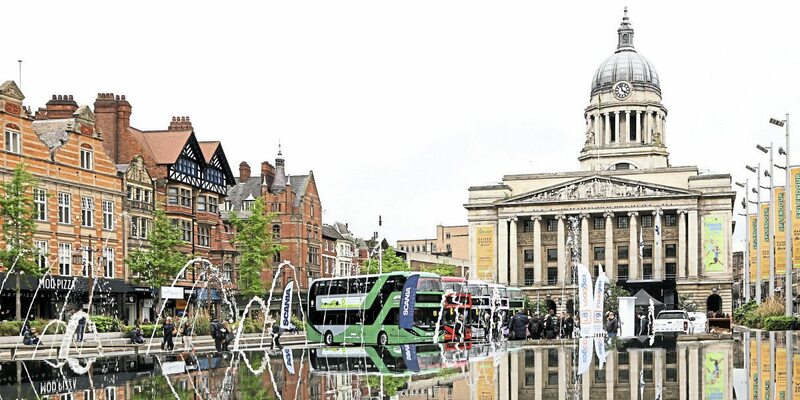 With work on the facilities progressing rapidly and the first vehicles completed to schedule, NCT with Scania and partners staged a public preview event last week in Nottingham’s Old Market Square, achieving a date planned many months previously. Five of the new vehicles were officially unveiled by the city’s Lord Mayor, Cllr Michael Edwards who spend a considerable time in the pouring rain inspecting the vehicles and talking to the gathered crowd, including many NCT customers and staff as well as teams from Scania, ADL, Roadgas and NCT themselves. 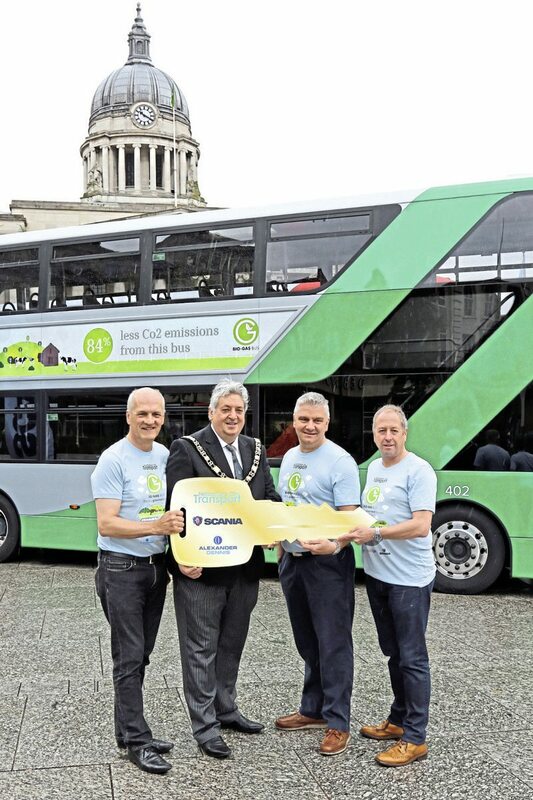 Replying to the Lord Mayor, NCT MD, Mark Fowles referred to a five year gestation period for the gas bus project and the positive experience of working with Scania and its partners. 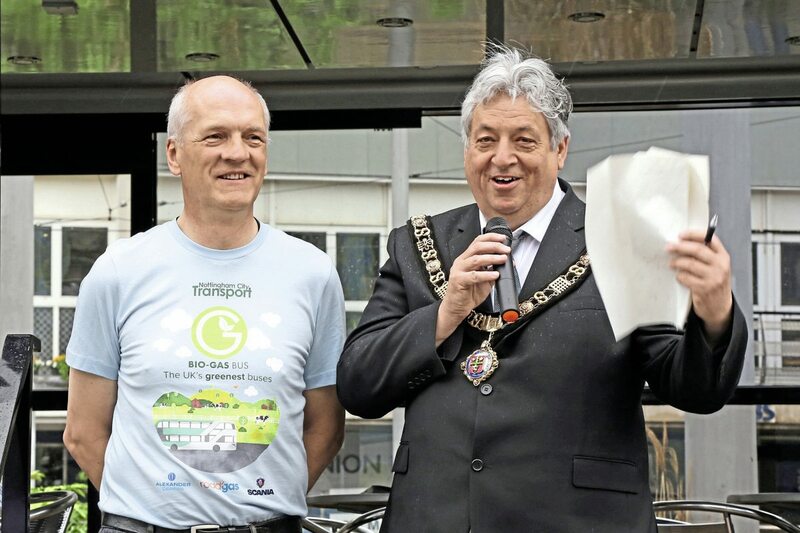 Referring to the environmental benefits of the biomethane powered vehicles, he expected the 53 vehicle fleet to reduce emissions by 3.5m kg CO2 and 36,000kg NOx per year compared with the Euro3 vehicles they would be replacing. In overall terms of well to wheel greenhouse gas emissions, the new gas buses would reduce the CO2 impact on the environment by 84% compared with a new diesel bus. (Comparison based on Euro5). Scania unveiled their N280 UD4x2EB bio-gas double decker with ADL Enviro400 MMC bodywork at Euro Bus Expo 2016, displaying a demonstrator on their stand and one of the first five production vehicles for Reading Buses on the ADL stand. 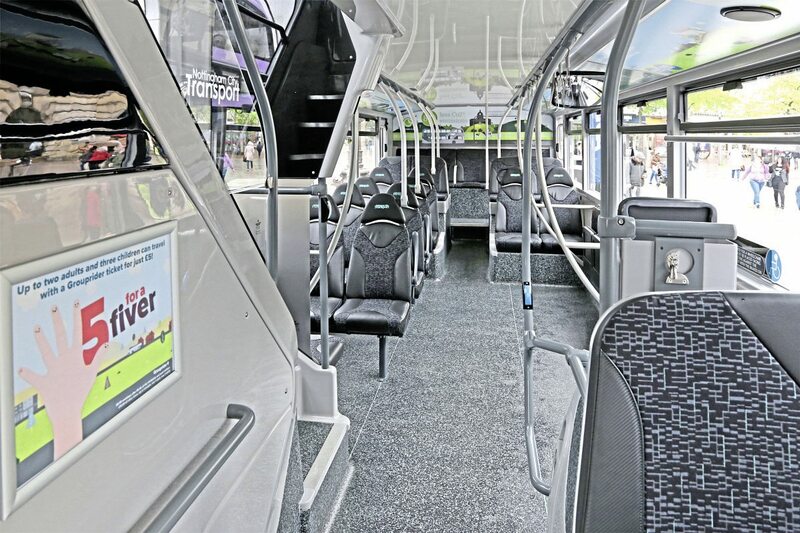 The demonstrator has subsequently been shown to a wide range of operators and interested bodies before taking up an in service trial with Arriva in Manchester. 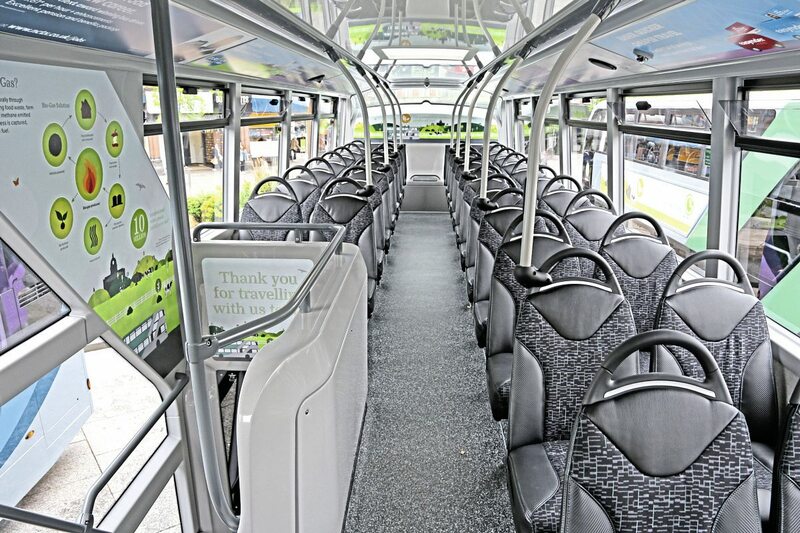 All of these MMC bodied vehicles feature a series of gas storage cylinders operating at 200bar located at the rear of the upper deck and under the stairs. 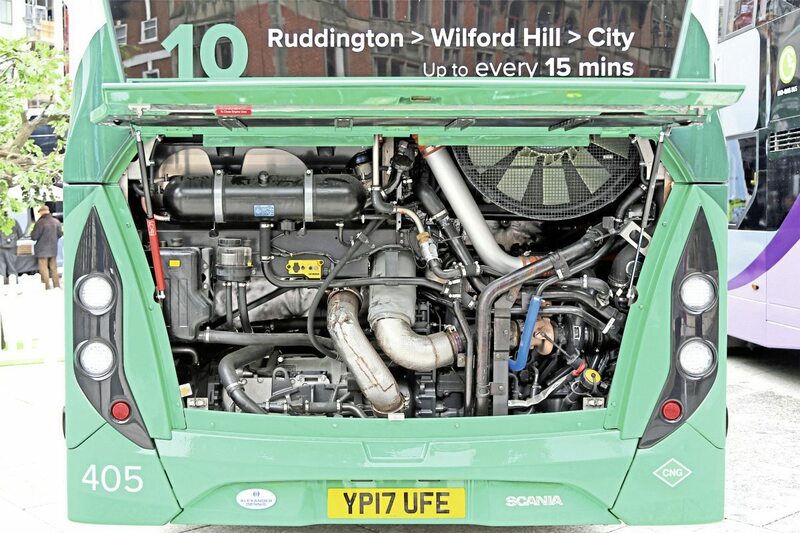 For the Nottingham application, the NCT team were looking for the added wow factor created by ADL’s City styling and additional gas capacity to achieve the maximum daily range expected from the fleet. The vehicles now being delivered reflect the outcome of close collaboration between NCT, Scania and ADL to deliver an innovative, safe and attractive package. 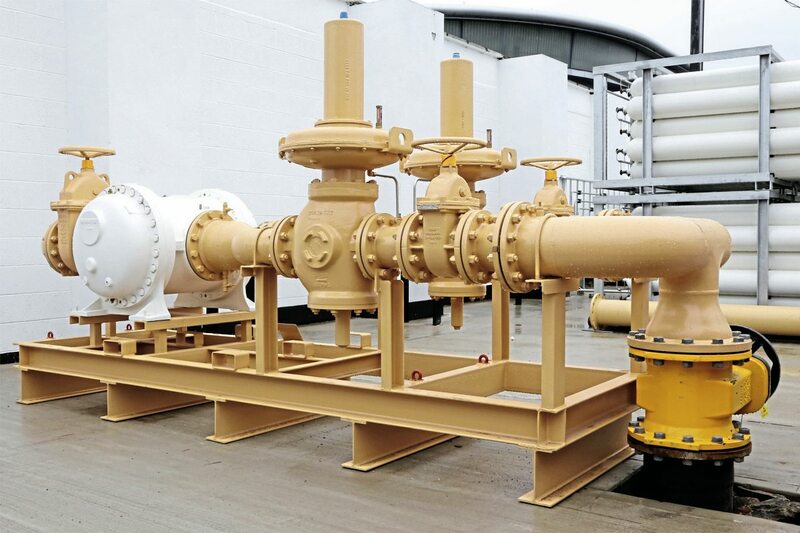 To achieve the additional range, the on board gas storage pressure has been increased to 250bar and the multiple tanks replaced by two larger tanks mounted in a substantial structure above the engine at the rear. This extends further into the upper saloon vertically but the impact of its intrusion is minimised by the glazed rear dome of the City’s upper deck. A key challenge in mounting the composite tanks at the rear has been achieving a 12tonne maximum loading on the rear axle and this has impacted on the seating layout with the rear seat upstairs configured for four passengers and an untrimmed centre space. Relocating the gas tanks has also simplified the gas pipework on the vehicle and allowed the gas filling point to be moved to the rear corner at a higher level. All gas pipework and equipment is now contained at the rear and sealed from the rest of the vehicle. The tanks with a total capacity of 1030litres have been sourced from Agility Fuel Solutions, a reputable and experienced US company with the necessary back up and support available if needed. The tanks are designed for a service life of 20 years and require no maintenance other than an annual visual inspection. All gas pipework whether operating at the 250bar storage pressure, or the 8.5bar engine delivery pressure after passing through the main regulator with preheat facility, is stainless steel with Swagelok fittings. Although the basic five cylinder 9litre gas engine remains the same, Scania have updated the engine software and ignition system to further increase the economy of operation. Each cylinder is equipped with an individual coil pack and managed sequentially to deliver just the right amount of fuel for each cycle. ZF Ecolife transmission is installed. UK Bus and Coach Fleet Sales Manager for Scania (Great Britain) Ltd, Mark Oliver confirmed that, even with the changes, there were still only some 40 different components between the gas vehicle and its diesel equivalent, also pointing out the engine’s commonality with the significant numbers installed in Scania gas trucks. Mark explained the background work with operators over a number of years to establish the requirements and viability of the gas double decker product. Studies had shown that, even without external funding and looking at whole life costs, a fleet of such vehicles could deliver a payback within 5.5 to seven years. 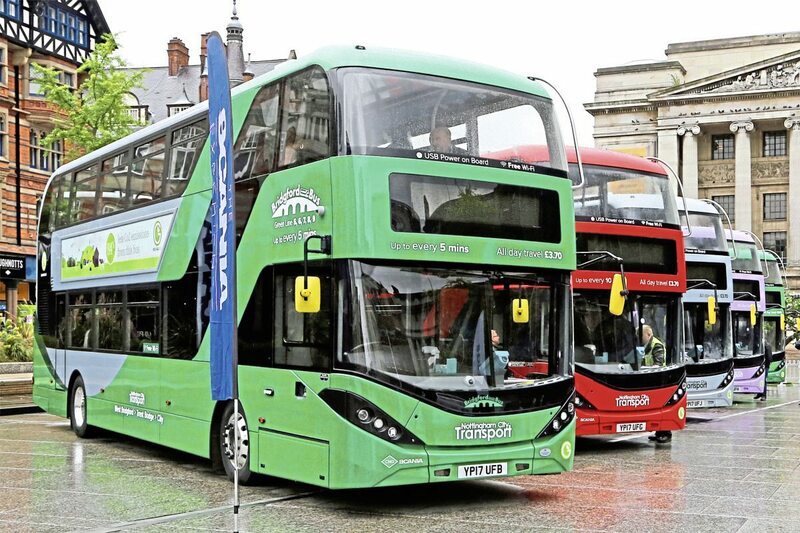 ADL has worked with Scania and NCT to deliver changes to the Enviro400 City body to suit gas operation and meet the enhanced specification requirements of NCT. 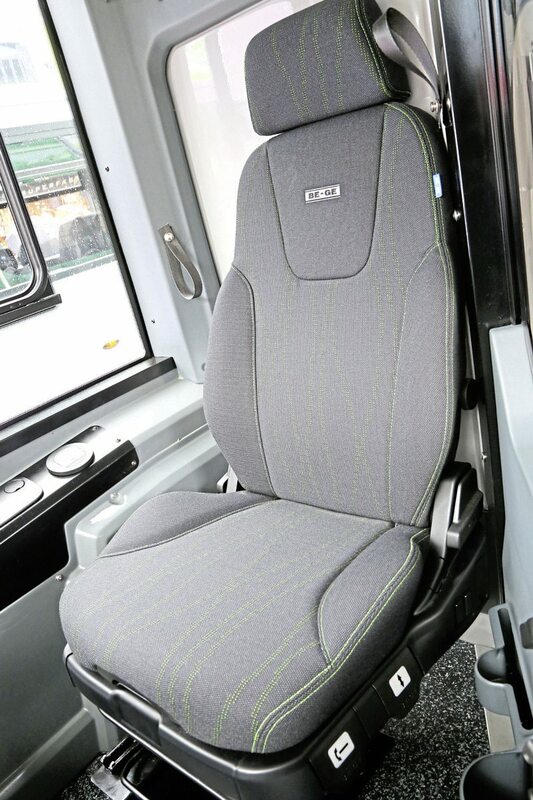 The first 14 vehicles being delivered, including those at the launch, have Isri Civic V3 seats trimmed in flat weave fabric with E-Leather inserts, the other 16 of the first batch will have Lazzarini seats prior to a decision being made on the second batch of 23. The first 14 vehicles also have Groeneveld automatic engine top up systems. Alcoa wheels have been specified. The new vehicles have 4G Wi-Fi systems, USB charging points, audible next stop announcements and a glass panel alongside the staircase. 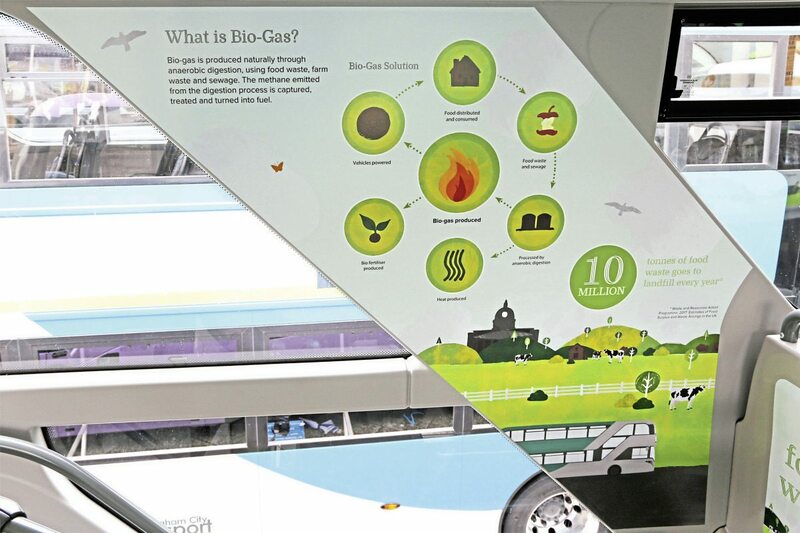 NCT’s in house design team has produced a variety of graphics promoting the cleanliness of bio-gas powered vehicles and these adorn the majority of the visible surfaces within the vehicle including the complex curves at the rear of the upper deck. 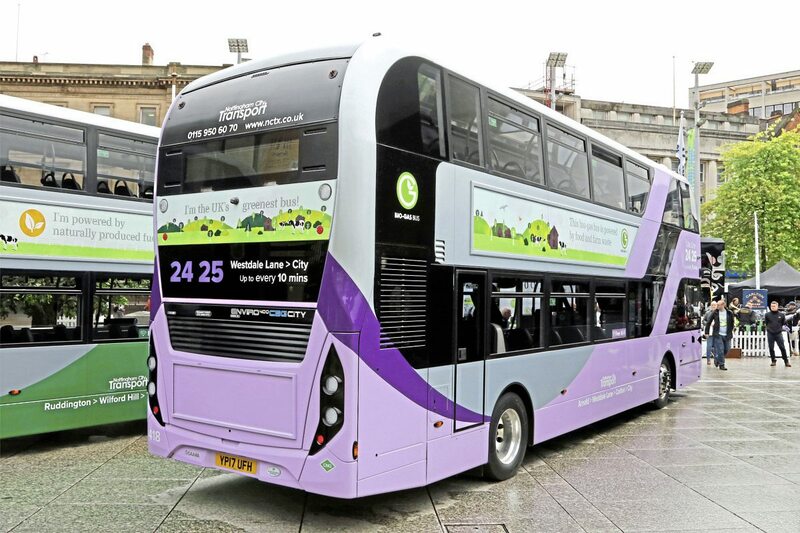 The first vehicles are due to enter service from around mid June on four of NCT’s coloured route groups and examples of each were on display at the preview together with a generically liveried example. The NCT graphics team has taken the opportunity to refresh the route branding and introduce slight changes to the shades used. Examples on display were the Green 6, Green 10, Lilac 24/5 and Red 44. These routes will be operated by the initial 30 vehicles being delivered during the summer, the remaining 23 vehicles to be delivered early in 2018 will be allocated to the Orange 36 and Sky Blue 45 routes. All the routes have been chosen to ensure the new vehicles deliver the maximum improvement in areas of the city with the poorest air quality. Before the formal unveiling of the vehicles, there was an opportunity to view the work in progress on the gas filling station at NCT’s Lower Parliament Street depot with NCT’s Engineering Director, Gary Mason. The filling station is being installed by Scania’s partner Roadgas, a local Nottinghamshire company involved with similar facilities across the UK including the Stagecoach operation in Sunderland. 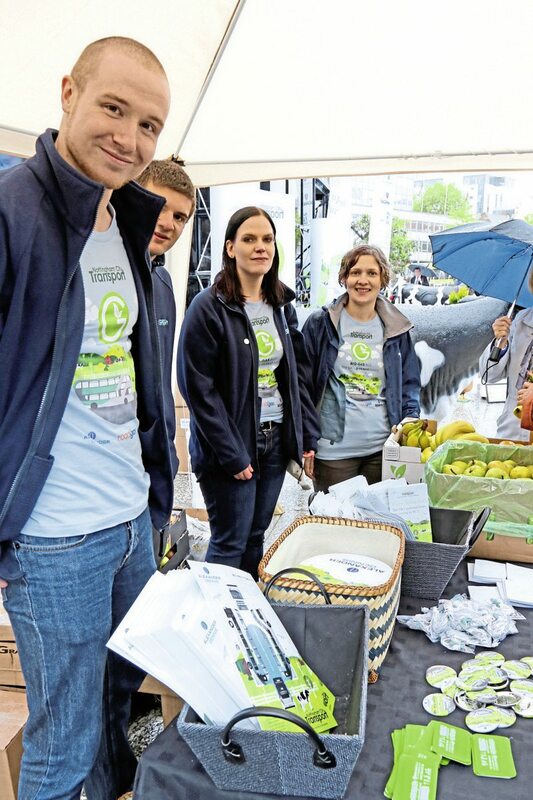 Roadgas also participated in the Old Market Square event, displaying one of the dispensers to be installed at the depot with Manager, Jon Harman, braving the rain to explain the bio-gas process to visitors. Careful management of the site has meant the loss of no more than two bus parking spaces to accommodate the installation which, although equipped to suit the initial 53 vehicle fleet, is scalable with additional compressors and accumulator banks to fuel the depot’s whole 160 vehicle allocation. 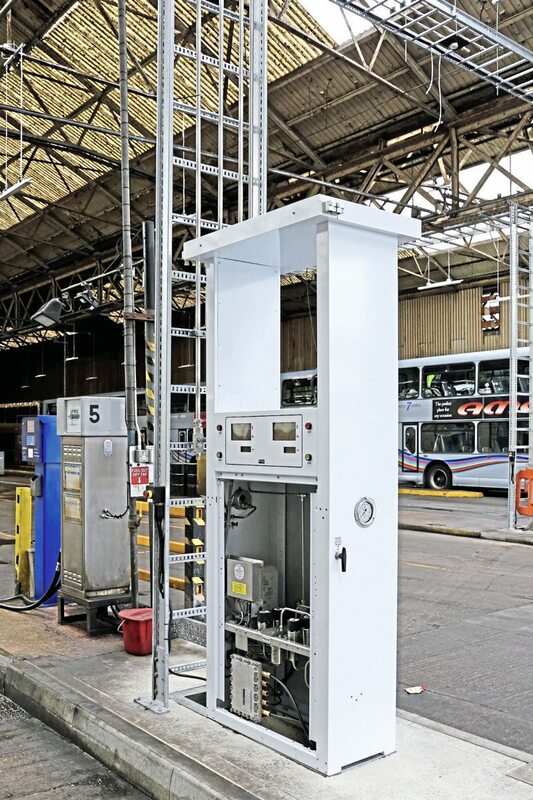 Initially three compressors are installed which charge the accumulators to 300bar from where pipework on an overhead gantry takes the gas to the fueling points just inside the depot. Here the gas vehicles will be fueled alongside and in the same timescales as the diesel fleet. 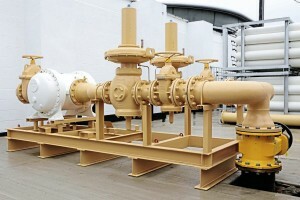 Like all infrastructure projects, one of the key challenges has been to install the required utility connections, both the 11kV electric supply to drive the compressors and the gas connection. Nottingham has an effective gas network with a large low pressure main capable of supplying NCT’s requirements passing the depot, albeit on the other side of the road. The challenge was to agree an appropriate window with the local authority to install the connection across the busy road, work was only allowed late on a Saturday evening and the crossing was finally achieved ‘just in time’ after a number of cancellations driven by city centre events. 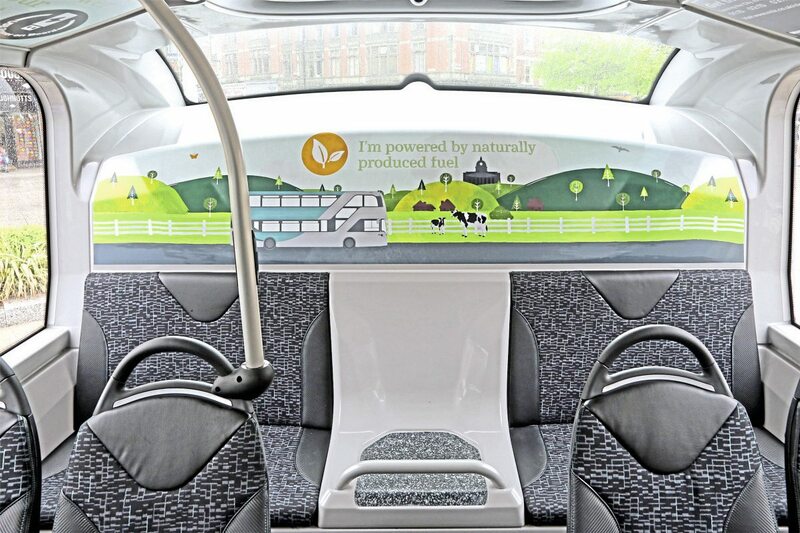 NCT’s investment in 53 bio-gas buses is a bold move that reinforces Nottingham’s position at the forefront of environmental and quality developments in the bus industry. Choosing gas means that a large scale contribution to improving air quality across the city and beyond can be made with products which are tested, durable and reliable. The infrastructure’s requirements are relatively unobtrusive and scalable to a significantly larger fleet without additional impact. Such forward thinking reflects NCT’s position as four times winner of the UK Bus Operator of the Year.